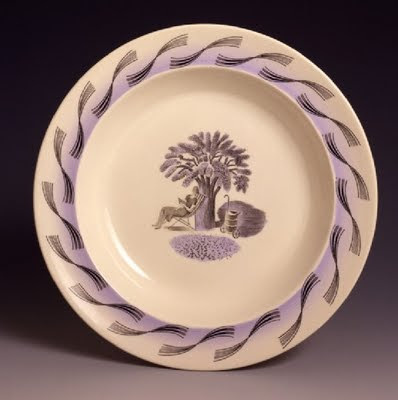 I've admired the work of British illustrator Eric Ravilious (1903-1942), but only recently became aware that he designed two garden-based series of china for Wedgwood, who were trying to be more hip and with-it by using Britain's most popular illustrator. Both designs feature his characteristic style of black and white line drawings with monochrome washes of color, and unusually, show real people relaxing in a garden animated by tools. It's a stark difference from the idealized gardens of most decorative arts portrayals in which neither workers nor their implements are visible, and the gardens apparently trim and weed themselves. 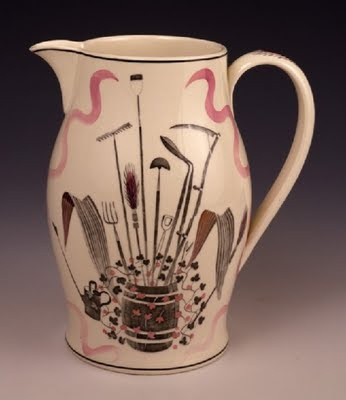 Garden Implements (1939) was a lemonade set featuring barrels of gardening tools, watering cans, a wheel barrow, a beehive, a greenhouse with lettuces, even a compost bin. There was also a limited edition of matching fabric, which has become extremely rare. "He insinuated a wry innocence, a sense of slight strangeness that characterises all of his work. In his watercolours he brought his 'innocent eye' to English rural subjects, bending rules so to speak to produce delicate fantasies out of well known entities such as greenhouses and watering cans." 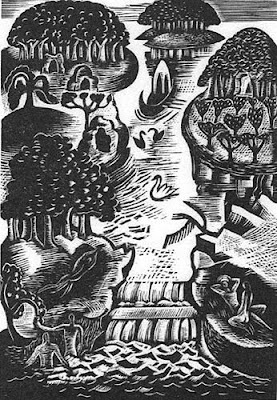 Ravilious was a student of Paul Nash, who produced a set of woodcuts to illustrate Thomas Browne's Garden of Cyrus (he of the Quincunx, previously blogged). Nash's "Paradise Garden" (1928) is the first photo below, and its close relative, Ravilious' "May" (1925) is the second. 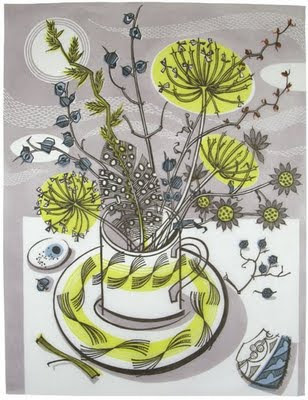 The genealogy continues with the work of contemporary printmaker Angie Lewin, who credits Ravilious both stylistically and literally in her works: 'Moonlit Cup' features the cup and saucer from Ravilious' Garden pattern. I bought some notecards by Angie when I was last in the UK and have been doling them out carefully (only the best of friends...) until I can get more on my next visit. There are few things more delightful than the work of Eric Ravilious and Angie Lewin. Even more so when they intersect. Thanks for a great post on two personal favorites. 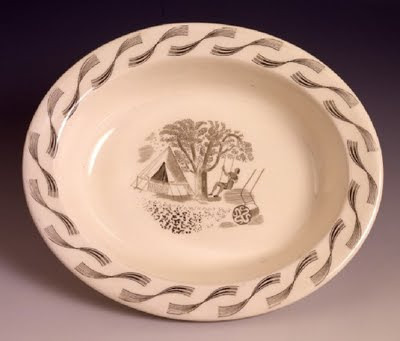 Interesting to see garden china/pottery that looks so 20th century. How lucky for the world that young people like you care about these things.....and spread the word! It's absolutely wonderful to have come across your blog. Great work!